Clutching a styrofoam cup precariously full of mulled wine, I strolled up and down the Champs-Élysées on Friday evening searching the Christmas Market for unique gift items to share with you. Amongst the chalets offering hot chocolate, roasted chestnuts and crepes, I noticed the ubiquitous glass ornaments with glittery Eiffel Towers, colorful scarves and pop-up Christmas cards, but nothing extraordinary. Disappointed by my unsuccessful quest, inspiration arrived on Saturday morning when I read Steph's post, Chandelle versus Bougie: A Brief History of Candles, that reminded me of a boutique I had been intending to visit. 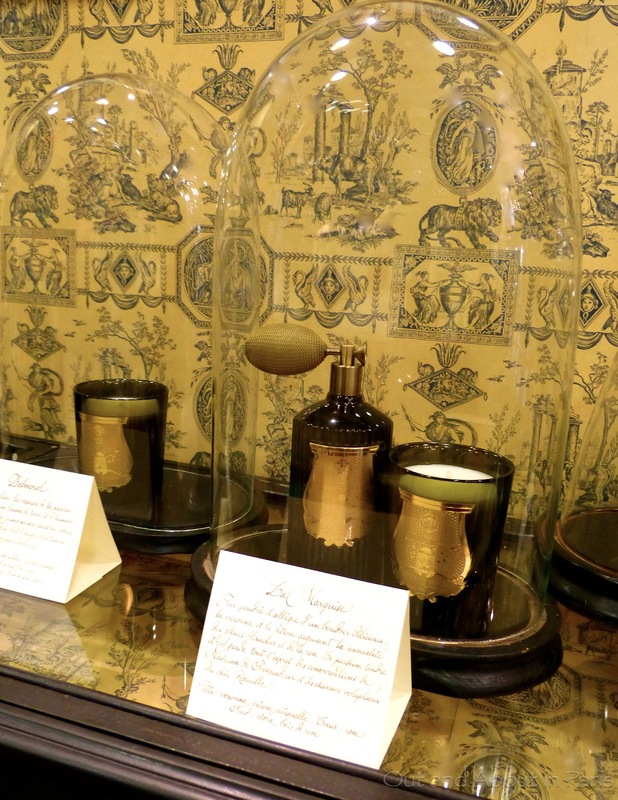 As soon as I walked into Cire Trudon, the world's oldest and most prestigious candle manufacturer, I knew that I had hit the jackpot. With the aroma of roses, lemon and mint wafting through the air, I watched as other customers discussed their candle needs with white-gloved salespeople using complex terms normally reserved for fine wine. An elderly man and his adult-aged son carefully sniffed the glass domes covering several scented candles before selecting the "Empire", a heady mixture of pine, sage and hay reminiscent of a Napoleonic camp, while a young boy chose a bright red Advent candle over the objections of his mother and grandmother, who kept telling him that the gold ones looked more festive. Knowing that Cire Trudon candles had illuminated the royal boudoirs of Versailles and the imperial court of Napoleon, I was pleasantly surprised to see that the Advent candles are a very affordable 4 euros. That's a much better deal than anything that I saw at the Christmas Market. With the expert assistance of a very friendly saleswoman, I sniffed my way around the boutique before settling on "La Marquise", a verbena and lemon scented candle that "rekindles the sharpness of Madame de Pompadour's conversations and the voluptuous charms of the Rocaille chic". As the burn time is 55 to 65 hours and the price is 6o euros, I quickly calculated that 1 euro is a reasonable price to pay for an hour of scented illumination during the long Parisian evenings. Additionally, Cire Trudon candles are 100% paraffin-free and devoid of any secondary minerals derived from petrol chemicals. During the weeks leading up to Christmas, I'm going to be on the lookout for other unique gift items. As I'm not normally much of a shopper, please let me know if you have a favorite boutique in Paris that I can share. To get the most out of your scented candles, here are some helpful tips from Joseph the Butler. My purchases: La Marquise candle in a hand blown Italian candle glass, a gold Advent candle and 2 cream-colored column candles. The 20 cm column candles are 1.80 euros per candle. a friend of mine....as I have for gifts in the past. These candles are remarkable....!! I also love their sealing wax....and they sell the seal tool as well ( not sure what the proper name is)......but I love to seal envelopes this old time way....classic. The candles burn for many joyful hours....!! A fabulous gift. I , too, went to the Christmas faire....it looked so cute, wooden huts with lights.....but, aside from the cotton candy....the merchandise left a lot to be desired. These candles .....a much better option!! I wish that we had met as well! Perhaps we'll bump into each other the next time that we're both at Trudon. Thanks for sharing your impressions of the Christmas Market. I wasn't sure if I'm becoming jaded or if there really isn't that much to get excited about. As for the candles, I agree that they're a much better option. Your friend is lucky! Even though I rarely write letters these days, I love the idea of using wax to seal an envelope. I love that advent candle, that brings back memories of lighting candles every Sunday for advent when I was a kid (although that candle seems to be a nightly affair). I forgot about that. It's been a while since I've had an advent calendar too. We used to have an advent wreath with 4 candles when I was a kid. The first time that I saw a single advent candle was in Switzerland. You should get an advent calendar for yourself - one with chocolate or something special inside when you open the little windows! I love the advent candle, I'd never seen these before. Trudon's "Ernesto" is my favorite--somewhat old man-ish smelling, but so rich. And I know of no one who produces anything like the heads of Marie Antoinette--brilliant, but would you burn them? I'm not sure I could, seems a little sad and destructive. 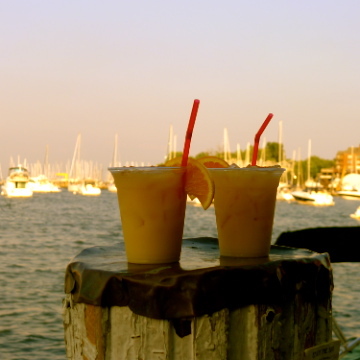 The colorful column candles--I'd imagine your mischievousness led you to tip them over. Or strongly want to tip them over. And thanks for the link to my usage blog entry--it really is important to let the candles burn to the glass or you create a well that will never burn fully. And Trudon candles are wider than most candles, so it's even more important. I'm going to have to smell the "Ernesto" the next time that I'm at Trudon. It's not one I sniffed. Is this description from their website accurate? "In a hotel of Havana, sizzling under the stubborn sun of the Revolution, fierce overtones of leather and tobacco meddle with resolution the waxy silence of wood. Breaking out of the cool dimness, sly grimaces emerge, framed by the smoke of cigars and the barrels of guns. top note : rum, grapefruit, bergamot / middle : clove, oak wood, patchouli, labdanum / base : tobacco harmony, moss, leather, amber"
I'm waiting for exactly the right night to burn my candle so that I can follow your instructions to a T! I'll be sure to let the wax melt to the glass. I forgot to mention that there's also a brooding Napoleon candle. I would have a hard time burning the Marie-Antoinette one. What a wonderful find! I need a little wedding gift for the son of some Australian friends. I'm sure I'm going to find just the thing! I'm looking forward to your other suggestions. A Trudon candle would make a very nice wedding present. I'll be on the lookout to see if I find anything else that would also work. Because of the cold, wet weather I did quite a bit of Christmas shopping in Paris last April. I bought some pillar candles with raised crests from Cire Trudon. Such a gorgeous shop and just around the corner from my apartment. I wish I had seen that Advent candle. My other favorite unusual shops where I purchased gifts were Stylo City (unusual playing cards), Anne Maisonneuve (beautiful, silk screened cotton tee shirts) and Au Bain Marie (gorgeous china and unique sets of tin plates with 19thc. scenes). They may not have had the Advent candles for sale when you were in Trudon in April, Carolyn. It's probably more of a seasonal item. Thanks for mentioning Stylo City. It has been on my list ever since you first told me about it. I'll have to check out the other places as well. I just took a look at the website for Anne Maisonneuve and they have a t-shirt with an Eiffel Tower made out of macarons. Fantastic! Candles are a fabulous gift. I've been doing the advertising for Root Candles for years. Root was founded in 1869 in Medina, Ohio, and is still owned by the fifth generation of Root's. They hand-dip their tapers (dinner candles) 35 times so the colors are true throughout -- no cheap white soy filler inside a colored wax "coat". I just completed a video covering the history of Root Candles - I'll send it to you via You Send It (10 minute film). I wish that I would have known about Root candles when we lived in Ohio, Bob! While waiting for the film to download, I took a look at their website and read about Helen Keller's friendship with A.I. Root. The history of the company is very interesting. Since Root products are widely available in the USA, they're a good alternative for people who live there. I didn't see one of the 24 day Advent candles on their website. Maybe you could suggest that they make some. The Advent candles at Trudon come in gold, red and white with notches marked on them for the 24 days prior to Christmas. Thanks for sending the film. It still has 24 more minutes until it's completely downloaded. I look forward to watching it! One after my own heart Mary Kay. Nothing is more friendly at Christmas than the gift of light. I include a small candle with all of my gifts at Christmas. The gift of light - what a perfect turn of phrase, Baron! I think that I'll follow your lead and include a small Trudon candle with our Christmas gifts this year. What a fantastic shop. And all those spooky baths you'll be having now! I haven't seen an advent candle for years - we always used to have one when we were kids. Time to start a new Dagg family tradition I think. I hope that you're able to find one of the Advent candles in your village and start a new family tradition, Steph. It was my pleasure to mention your blog, especially since it's what prompted me to go to Trudon! I'm such a candle gal (I'm burning a milk chocolate candle at this very moment making my apartment smell like a Hershey factory!) and I'm always on the hunt for a new shop with quality "luxe" candles. Perhaps I'll replace my yearly Diptyque splurge here at Cire Trudon! Thanks MK! It's really strange - I wrote a response to your comment the other day but can't find it anywhere. Not even in spam. A chocolate candle sounds amazing, but I'm worried that the smell would have me craving chocolate whenever I burned it. I'll have to check out the candles at Diptyque! I haven't been there yet. I was there for the first time recently and was enchanted but couldn't bring myself to spend the euros! I had just bought several Diptyque, so I couldn't justify it. When I was there I asked if I could take pictures and I was declined! Did you have to sweet talk them? I was so disappointed. Perhaps if you give me your secret password I will go back and try again. Also, when I was there I overheard one of the workers tell customers that airlines would not let you pack candles in either carry-on or checked luggage. Anyone done it recently? I would be sick if those expensive candles were confiscated! No secret password - I just asked if I could take a couple of photos of their candles for a blog post that I was planning to write about their store. The first person I asked had to check with someone else for me to get approval. I don't know if there are any rules prohibiting candles in carry-on or checked luggage but there was an American woman buying LOTS of candles to take to the States. She said that they're what she always gives as gifts and that the recipients love them. I went back the other day because I realized I needed tapers for my Thanksgiving table. This time I asked someone else and got permission. The tapers burned so nicely- I think I am sold! I'm happy that you were able to take some photos - without having to use the magic password! Nice post! Thanks for sharing your awesome thoughts! I like this!